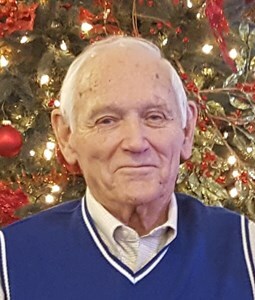 Harry Grant Ford, 89, of Floyds Knobs, Indiana, passed away on Thursday, April 11, 2019. Harry was a proud veteran of the U.S. Navy and an avid UK fan. He was a member and deacon of the Dover Chapel Baptist Church in Louisville, Kentucky. He was born on January 17, 1930, in Hartford, Kentucky, to the late Claude, Sr., and Artie (Grant) Ford. Along with his parents, he is preceded in death by his wife, Mona "Jean" (Sandefur) Ford; sons, Robert L. Ford and Gerald T. Ford; and siblings, Claude Ford, Jr., Douglas Ford, Felix Ford, and James Ford. Harry is survived by his daughter, Lisa (Larry) Marcum; 8 grandchildren; 18 great-grandchildren; 1 great-great-grandchildren; and brother, Gerald Ford. Visitation will be from 2:00 p.m. to 8:00 p.m. on Tuesday, April 16, 2019, at Newcomer Cremations, Funerals & Receptions - New Albany. His Funeral Service will be at 11:00 a.m. on Wednesday at the funeral home with burial and military honors to follow at Greenlawn Cemetery in Greenville, Indiana. The family requests that contributions in Harry’s memory be made to Shively Area Ministries (4415 Dixie Hwy. Louisville, KY 40216). Add your memories to the guest book of Harry Ford. Uncle Harry was a very good uncle, he always had a smile on his face, very likable to be around and he's gonna be missed . Harry will be greatly missed. He was a great neighbor and an even better friend. We love and miss you Harry. Our thoughts and prayers are with his family and friends.